The Mounted Branch provides a state-wide response in support of operational police at incidents of public order management, planned and targeted patrols, land searches and community engagement events within and across Victorian communities. Patrols form the largest component (time wise) of Mounted Branch duties. These patrols are normally requested and targeted by local regions and divisions who have issues with high volume crime. Some examples are theft of motor cars, theft from motor cars, burglaries, drug activity, street drags, traffic offences and street or behaviour offences. Patrols are rostered both day and night in central Melbourne, suburban Melbourne and rural areas. The high visible police presence is a major reason for the success of these patrols; as well as the support the horses and riders can offer operational police in various situations. The Mounted Branc assists with public order management at demonstrations/protests, sporting events such as soccer matches, major events such as music festivals and any other event where large crowds gather, such as New Year's Eve celebrations. The Mounted Branch members train with other specialist police units, including the Public Order Response Team (PORT) to ensure safety of the officers and the public at these events. The Mounted Branch is regularly used to support land-based searches primarily for missing or wanted persons. They have the ability to travel extended distances, transverse difficult terrain where vehicles are unable to go. They are also utilised for evidence searches and have the advantage of searching from an elevated platform to see over fences, through crowds and further into the distance. The Mounted Branch still performs a small amount of ceremonial duties, such as regal and vice regal escorts. Some parades are still attended to by the branch, including Anzac Day and the Grand Final Parade. The Mounted Branch also performs a ceremonial role at police funerals. Training of police riders and horses is conducted on a weekly basis to maintain the skill of riders and horses. Members at the Mounted Branch are required to maintain a high level of physical fitness and undergo specialist training. They are formally re-assessed annually to make sure that this standard is maintained. Riders selected to work at the Mounted Branch are confirmed Constables or Senior Constables who have completed probationary training and have a strong interest in performing operational police work from horseback. The branch currently uses Warmblood type horses, Thoroughbreds, Standardbreds and Clydesdale cross breeds. Breeding of Warmbloods ceased in 2005, so the Branch now purchases horses from the general public. We also trial and accept donated horses. Horses generally come in to be assessed on a 90 day trial, with an average of 1 in 10 making the grade and eventually becoming a troop horse. The Mounted Branch has a minimum requirement of 16.1hh or higher for its troop horse's. The branch will accept any breed or colour if the horse is between 5-12 years old, is sound, of a calm disposition, trainable, brave and obedient. The Mounted Branch has a state-of-the-art horse truck, capable of transporting six horses and has sleeping and living quarters for up to four members. To supplement this there are also several 4WD vehicles which each tow a two-horse float. Members are required to maintain several uniforms at the Mounted Branch, including stable fatigues, general patrols uniform, demonstration uniform and ceremonial uniform. Similarly, several types of equipment and tack are used on the horses including general patrol gear, exercise equipment, demonstration equipment including protective visors for the horses' faces, stock gear for searches and ceremonial accoutrements. 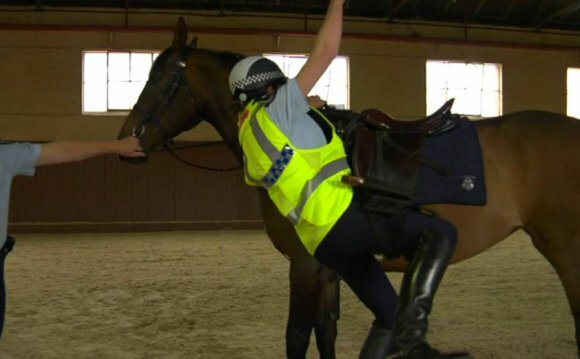 Horses have been used by police in Victoria since Military Mounted Police rode into the colony in 1836. The establishment of Victoria Police in 1853 brought several mounted units together under the banner of the Mounted Branch. Horse and rider numbers increased in line with Victoria's population, till they reached a peak in the early 1900s with 211 Mounted Stations throughout the state. The introduction of the motor car replaced the horses at these stations until the last Mounted Station at Buninyong was closed in 1965. In the past, the central Melbourne stables had been located on the banks of the Yarra, near to where the MCG and Olympic Park are today, as well as in St Kilda Road. The stables are on the grounds of the old Police Depot, one block from St Kilda Road in South Melbourne, in what is now called the Southbank area. These stables are the original stables built around World War I, when the police depot was also built. The stables are capable of housing around 50 horses if required, as well as having an indoor riding school and facilities for members.